Bhandarkar was asked about it when he attended the launch of Farah Khan Ali's book "Farah Khan - A Bejewelled Life" here. Taimur is one celebrity kid who is the blue eyed boy of the paparazzi in Mumbai, and his photographs and videos keep going viral on social media. Late last year, reports emerged that Bhandarkar had registered 'Taimur' as a film title, sparking rumours that a movie on the 2-year-old may be in the making. Bhandarkar, who directed Kareena in "Heroine", however, said: "No... it is nothing like that. My production house keeps registering titles, so there are many such titles like 'Awards' or 'Bollywood Vibes', so that doesn't mean that we are making a film right now." 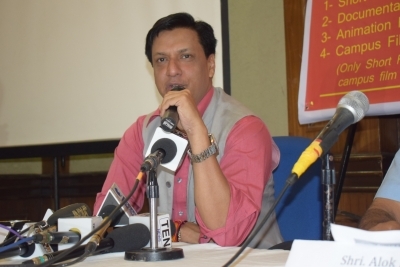 On his next film titled "Ghalib", Bhandarkar said: "My journey starting from my first film 'Chandni Bar' to my last film 'Indu Sarkar' has been really fantastic. Right now, I am working on a film which is titled as 'Ghalib'. It is based on sand mafias. I have been doing research for this film since last 6-8 months. "I am also working on a web series, so I have been busy with all these things. The kind of cinema I prefer to do, it takes time to work on those films. I am happy that it's on the fag end of completing and surely very soon, I will make announcement about it." Recently, the organisers of Master Deenanath Mangeshkar Awards announced that Bhandarkar will receive a special award for his contribution to Indian cinema. He said: "It's a big achievement for me."